Symbian Anna Update Coming Soon To N8? Many N8 owners have grown frustrated over the constant delays of the Symbian Anna update, and rightly so -- it was originally slated for 'early 2011' yet we're now entering Q3 with no signs of Anna... until now. 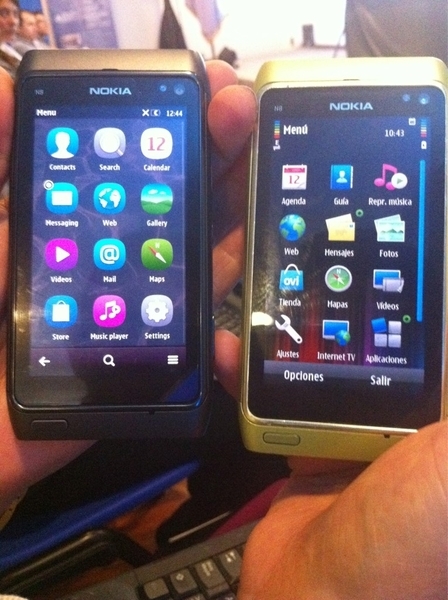 Christian Espinosa of Cobertura movil has posted a picture showing a Nokia N8 running the new Anna update. You might notice that the N8 looks new (screen protector still on), perhaps this suggests that recently-produced N8s will be shipped with Anna? If so, the update for old N8s shouldn't be too far behind. Christian conveniently placed a non-Anna N8 in the picture, allowing for comparisons to be drawn against Symbian^3. The most obvious difference is the new, rounded icons of Anna, which I'm personally not too fond of. It does also look like the new Nokia 'Pure' font is being used, but I'm not 100% sure on that yet. Down at the bottom, icons have now replaced the 'options' and 'back' text that has been with S60 (and then Symbian) for so long. This has allowed for a search option to be integrated into the toolbar. Thanks go to Symbiantweet for spotting this! Are you sure? The source of the image makes no mention of Belle and specifically mentions Anna.